Environmental Management Systems, HSEMS, ISO 14000/18000 or EMAS. Oil Spill Contingency Planning, Modelling. We provide environmental services for all stages of the offshore exploration and production cycle through to the decommissioning phase. We undertake specific marine surveys to support any requirements during exploration and appraisal phases of projects. We also provide the necessary expertise to enable environmental planning for all off‑ shore oil and gas field infrastructure development. This may include the preparation of oil spill contingency plans, marine and atmospheric dispersion modelling, risk assessments (including QRA), sensitivity mapping, and provide a framework for appropriate monitoring and auditing work. This relates to construction and installation of fixed, floating and subsea production facilities and export facilities. Our team was commissioned to undertake an Environmental and Social Impact Assessment (ESIA) for a multi-client 2D Seismic Survey covering majority of offshore concession areas in Sierra Leone. 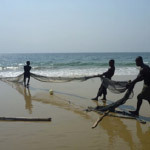 Services included; EPA-SL liaison, stakeholder engagement along entire coastline of Sierra Leone, EIA disclosure to affected communities, press and radio coverage, Community Development Planning. Monitoring during operations includes Marine Mammal Observing and Fisheries reporting to EPA-SL. In 2009, our team was commissioned by Anadarko Petroleum Corporation to undertake an ESIA for 2D and 3D seismic surveys in Liberia. This was subsequently followed by provision of Marine Mammal Observers (MMO’s) and Passive Acoustic Monitoring (PAM) for offshore seismic surveys. Since, 2009 our involvement in studies for the offshore O&G industry in Liberia has continued and we are currently providing EPA liaison Environmental Observers (MMO’s) for a 6 month 3D seismic survey, offshore Liberia for TGS-NOPEC Geophysical Co. ASA. Ongoing environmental support and development of environmental management systems, monitoring for DNO’s assets in Oman and UAE. EIA and field development support for West Bukha, Oman and Saleh field, UAE drilling and production. Offshore monitoring and auditing during drilling. Climate, energy and emissions reporting.